The artist, Hillary Graham will conduct two walkabouts of the exhibition, Remembering the SS Mendi. The first walkabout will take place on 22 February at 13h00 and the walkabout will be repeated at 17h30. Each walkabout will be for 1 hour long. The Mendi installation was produced by Graham over a five year period from 1987 and was first exhibited in 1993 at the National Art’s Festival held in Grahamstown. The Art Museum loaned the exhibition in 1994 and purchased the work for the permanent collection in 1995. 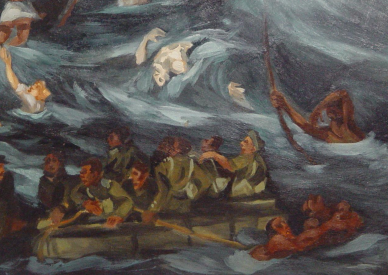 Remembering the tragic loss of life when the SS Mendi sank has become a rallying point in Post-Apartheid South African to recover the lost history of black soldiers and the role these men played in World War One. Of the many South Africans soldiers who perished on this night, the majority were black South Africans troops heading for the front lines of the First World War in supportive positions. Graham was initially inspired to investigate this tragic event through the research of historian Norman Clothier who helped bring attention to this event through his book Black Valor published in 1987.